People have goals. In fact, that may be the defining element of our human nature. We´ve been called the “Knowing Man” (Homo sapiens), the “Learning Man” (Homo discens) and even the “Story-telling Man” (Homo narrans) – among lots of other things. In one of their latest works, Martin Seligman, spiritus rector of Positive Psychology, and Roy Baumeister posit that we are “Homo prospectus”: the “envisioning man” – precisely due to the fact that we are always “drawn by the future”. We are always “on to something”: places to go, people to meet, things to do. On a closer look, it is strikingly odd trying to imagine a (living and healthy) person that does not have any goals, however small they may be. To that effect, we are also drawn by our future selves. There is always an upgrade, a “Me 2.0”. It may wait around the next corner or in a distant future – but again: it´s hard to imagine a person that has stopped trying to “become something else” (and most likely: something “better” – whatever that may be). So, if goals and goal-striving play such an important part in all our lives: Why does it go wrong so often? Why do people lose their motivation while being on their way? Or, even more interesting: Why do they reach their goals and end up being disillusioned and unhappier than they were before? Some very valuable answers to these questions are provided by Self-Determination Theory (Ryan & Deci, 2000), and the Self-Concordance Model of (healthy) goal-striving (Sheldon & Elliot, 1999), an adjacent framework. 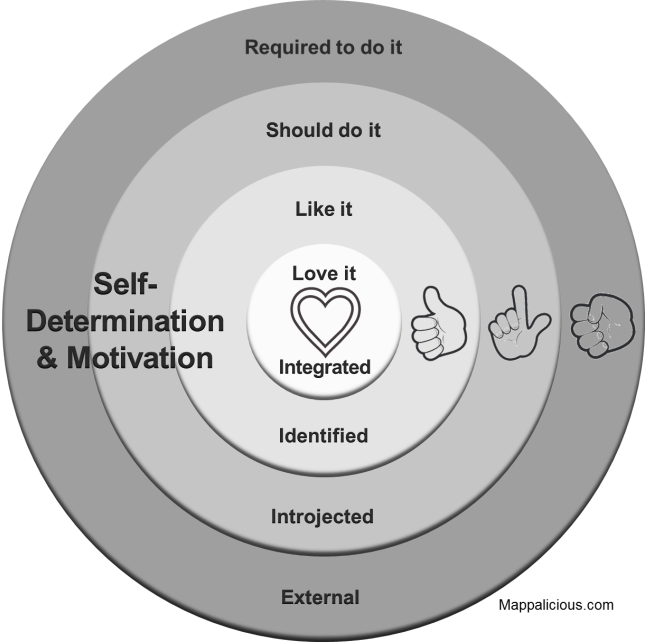 Self-Determination Theory* suggests there are four distinguishable levels of motivation, or more precisely: regulations of behavior: integrated, identified, introjected, and external. The level is determined by the degree of internalization of a specific goal – you might also say: how close it is to our “true selves”; and it´s also a way of describing the path from very little to full autonomy in the process of pursuing a goal. External: When we are forced to do something or carry out an action only because of an external reward (“In it for the money…”). Introjected: When we rely on external goals and standards of evaluation, trying (more or less fruitlessly) to “make them our own”: E.g., doing something in order to raise our own self-esteem. Identified: When we really get to the point of making a once external goal “our own”. This involves willfully appreciating a goal so that it is accepted as personally important. Integrated: When behavioral regulation is entirely assimilated with self and therefore included in a person’s self-evaluations and beliefs about personal needs. Integrated motivation shares a lot of attributes with intrinsic motivation but is nonetheless classified as extrinsic – because the goal in question is still pursued for reasons extrinsic to the self, rather than the inherent enjoyment of the task. The self-concordance of goals (i.e., their consistency with the person’s developing interests and core values) plays a dual role in the model. First, those pursuing self-concordant goals put more sustained effort into achieving those goals and thus are more likely to attain them. Second, those who attain self-concordant goals reap greater well-being benefits from their attainment. Attainment-to-well-being effects are mediated by need satisfaction, i.e., daily activity-based experiences of autonomy, competence, and relatedness that accumulate during the period of striving. So the basic idea is pretty straight-forward: We exert more effort when pursuing goals that are “close to our heart” (contrary to mostly extrinsically regulated goals). More effort leads to progress and a higher likelihood of goal attainment. And in turn, reaching goals makes us happy. But that´s not the end of the story: When we choose to pursue self-concordant goals, the act of moving forward is satisfying in itself. Why is that the case? 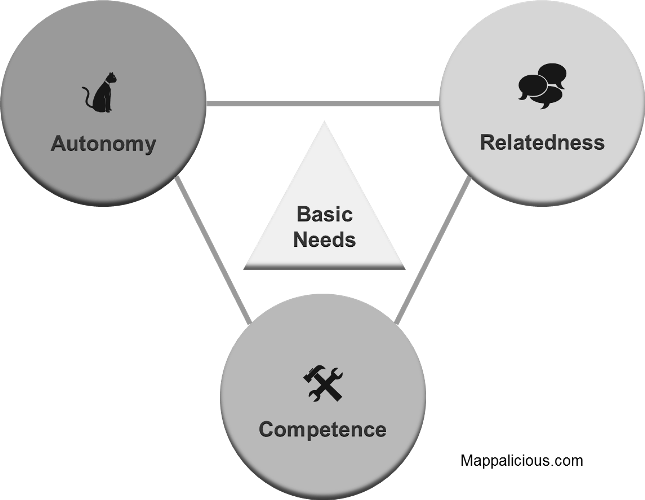 The theory posits that pursuing self-concordant goals is associated with satisfying three basic psychological needs: The needs for competence, autonomy, and relatedness. Competence: We desperately want to feel competent, at least in those areas of life that are of interest to us. Think of a small child that has just learned a new skill. Typically, it will use this capability over and over again – just for the fun of it. Autonomy: We desperately want to feel in control of our lives, and being able to make our own decisions. Think of a small child that discovers it´s free will and enjoys to do so. The “Terrible Twos” are something parents should be proud of – even though it´s probably difficult to enjoy at that time. Relatedness: We desperately want to feel close to other people (that are important in our lives), we want to feel accepted, and at best: loved. Think of a small child that seeks the comfort of his parents after some time of absence. Do I foster an environment that caters to the fulfillment of these needs with regards to the people I´m involved with? Work: A transactional leadership style fosters Self-Concordance, and thus, positive job attitudes in followers. Education: Pursuing self-concordant goals leads to higher motivation and goal attainment in a college population. Sports: Self-Concordance predicts need satisfaction, and subsequently, effort and well-being of athletes. Coaching: Really good news for my (secondary) profession: Just a single coaching session with focus on fostering self-concordance can markedly increase this vital aspect of our lives. We do not cherish our victories when the goals we´ve pursued were never our own in the first place. In that case, “getting there” doesn´t feel sweet and rewarding, but rather stale and phony. *The circular image of SDT has been adapted from a diagram in the aforementioned article on SDT and coaching. An overview of hundreds (literally…) of studies can be found here. Enjoy! I notice that your circular diagram does not include intrinsic motivation which is an important component of Self-Determination Theory. Are you conflating intrinsic motivation and integrated regulation? No, the circular diagram just refers to the more or less “external” aspects. Intrinsic motivation is covered in last diagram of that post.